As the calendar resets itself for another year we look forward to the beginning of spring and the new lease of life our garden can bring us. Despite the happy promise of warmer times to come, the bleak winter weather can sometimes make us feel a little lost when it comes to ideas for our gardens, which is why I’d like to mention some places that are always bursting with clever design ideas for your garden. 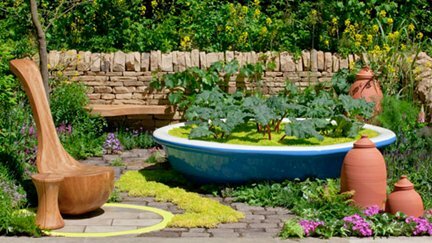 As anyone who has ever watched the Chelsea Flower Show coverage on television will know, show gardens are a major part of any garden or landscape exhibition. They demonstrate a wide range of innovative designs, interesting materials and inspirational planting ideas. Over the years we can see how the dialogue between gardens and any given point in time have affected each other, from old Victorian gardens to modern city ones. 21st century gardening is highly focused on sustainability, just think of River Cottage or Jimmy’s Food Factory, and we are seeing a marked rise in gardeners growing their own fruit and vegetables, as well as an increased number of projects that help to regenerate and bring together communities through gardening and the great outdoors. Established in 1972 the British Association of Landscape Industries represents the UK’s landscaping sector. From companies to designers this show promises high end landscaping products and demonstrations from people at the top of the landscaping industry. The Royal Horticultural Society’s flagship show. No introduction is needed here as the show speaks for itself, it’s the biggest and the best in the whole of the UK. Tickets are already on sale and a list of exhibitors and gardens is available on their website. I do hope this helps to get you thinking ahead to warmer times and generates some inspiration for your own gardens. Arbworx is always ready to help at any stage from the design to the build so if you find yourself inspired you know where to find us!